Call in for a no obligation chat with Cesar about your requirements, or call for a booking now. We have moved, but not far! 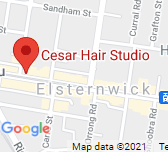 Our new salon is at 339 Glen Huntly Rd Elsternwick. Two doors east of the Bendigo Bank. My mum, sister and l have been coming to see Cesar for over 10 years, always does a wonderful job as we are forever challenging him with our varying requests which he fulfills every time.